tie logos, inside book covers and so forth. 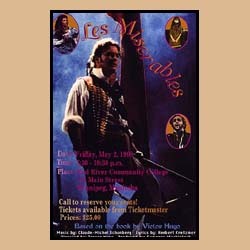 Mary Mikawoz created this Les Miserable poster by considering important characters and elements of the play. As the play has forboding elements with aspects of positive hope, the poster is mainly dark but with some elements of light to indicate the potential to overcome life's obstacles.